Fine Garden Art is a company that makes unique, one-of-kind art for the garden: creatures, arches, arbors, water features, abstract pieces, large sculptures, small sculptures, containers, planters, and more. FGA was started in 1996 by Jill Nooney and Bob Munger. Jill is the artist, i.e. problem maker, and Bob is the problem solver. 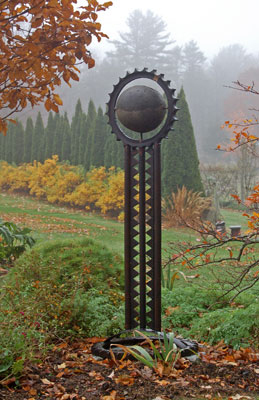 We are located at Bedrock Farm, in Lee NH, and much of the art is placed, in situ, in Bedrock Gardens. • The Art, with photographs and descriptions. • Information about the company, Fine Garden Art. • The Schedule of Open Houses and Events. • Information about Jill and Bob and Bedrock Gardens. Virtually all of the art that you are about to see is one-of-a-kind. Many are made from objects that have had former lives of usefulness, such as century old farm equipment, Bundt cake pans and brass door knobs. These are recombined into pieces of art that now have another life – bringing interest and depth of association to a garden. Note: if you are looking for information on Bedrock Gardens, please go to bedrockgardens.org. Hello all, Happy New Year! We are expanding the days we are open this year and have added the month of October. other times by appointment - check out our new parking area, we hope it cuts down congestion on the road.